We are a leading Manufacturer of multi spring bellow 71 seal, reverse balencing seal and teflon coated single spring from Ahmedabad, India. Multi Spring Bellow 71 Seal are Specially Designed for using Extremely Corrosive Duties. All Metal Components are including springs are Isolated from the Sealed, Aggressive Medium. These Seal Design Faces are moulded with Glass Filled PTFE with Highly Flexible PTFE Bellow. Simple checkout method function and cleaning possibility as this Mechanical Seal located easily accessible outside the pump. 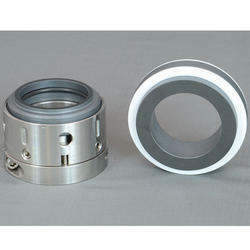 Seal Type 74 Mechanical Seal are Externally Mounted Reverse Balencing Seal having 'O' Ring as a Secondary Sealing member. Secondary Sealing member can be changed as per Chemical Compatibility. All metal components including springs are Isolated from the Sealed, Aggressive Medium. Simple checkout method function and cleaning possibility as this Mechanical Seal located easily access outside the pump. Especially design Clamp Ring eliminate Slipping on Shaft. Teflon Coated Single Spring are Specially Designed for using Extremely Corrosive Duties. All Metal Components are including springs are Isolated from the Sealed, Aggressive Medium. These Seal Design Faces are moulded with Glass Filled PTFE with Highly Flexible PTFE Bellow. Simple checkout method function and cleaning possibility as this Mechanical Seal located easily accessible outside the pump. Production Capacity: 1" , 1.125" , 1.375" , 1.625" , 1.750" , 1.875"